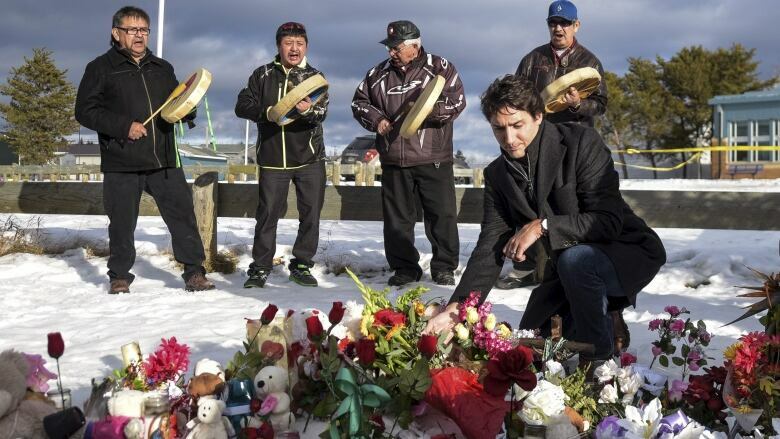 Prime Minister Justin Trudeau has announced $2.2 million in funding to be paid over a five-year period for the Dene High School in La Loche, Sask., a day after the three-year anniversary of a mass shooting that left four people dead. The money is to be used for "cultural and language-based programs, on-the-land activities, and mental health services" for students in the northern village. "We believe that the funding is important, but what it is exactly spent on is equally important," Trudeau said when he was questioned why it took three years for assistance to be announced. "There were immediate flowings of funds after the tragedy," the prime minister noted. "In terms of the right investments to build a resilient community, not just in response to a disaster, a tragedy, but for the medium and long term, we needed to make sure we're getting it right and that is what we've been doing until today." Georgina Jolibois, former La Loche mayor and current NDP MP for the Desnethé-Missinippi-Churchill River riding, was sharply critical of the federal government. "Three years ago, the prime minister said that his government would be here for La Loche months and years following the tragedy as part of our healing journey," she said in a release. "But we're not seeing the government's actions. They took their photos and left." Jolibois said the federal government has not done enough to provide long-term mental health supports in the community. "The announcement is far short of what the community is asking for. It's a bit insulting for the prime minister to say his government is listening when the difference between what they're giving and what's been asked for is so large," said another statement from Jolibois released later in the day. St. Pierre said the funding announcement is an important step as the community continues on its healing journey. He said there is no plan in place for the money as of now, but that will come later. "I do know that structures being in place and housing for staff is important, integral to the plan," St. Pierre said after the announcements were made. "I'm very happy with the results today." On Jan. 22, 2016, a then 17-year-old killed two teens with a shotgun in a home in La Loche. He then went to the local high school, where he killed two more people and injured seven others. Trudeau previously visited the village in January 2016 following the shootings. "When you asked for more help, our government listened and responded," Trudeau said on Wednesday, referring to his 2016 visit. "This is about listening to you. After all, you are best placed to know what your school community needs. So this investment … will help Dene High School begin to write a new chapter." Saskatchewan Premier Scott Moe was also in La Loche, where the province announced it would partner with a local business to develop 12 housing units for people working in health or education. Moe said the province will join Methy Construction and Maintenance on the project. The units are expected to cost a combined $3 million, but how much of that would be paid by the province has not been determined, according to a government spokesperson. "We are hopeful that this additional housing can assist the ongoing recruitment effort in La Loche," Moe said. Fourteen housing units have already been built over the past three years, Moe noted. "Is there more to do? Yes, we need to continue building in La Loche and other areas of the province as well, but this will go further down the path of providing housing for the people that may be from this community," who are working in education or health care in La Loche, Moe said. A previous version of this story said the Saskatchewan government was contributing $3 million to a project to build housing units in La Loche. In fact, the entire project, for which the province is partnering with a local business, is expected to cost $3 million. A government spokesperson said it is not yet known how much of that would be paid for by the province. A previous version of this story said Georgina Jolibois is the NDP MLA for the Desnethé-Missinippi-Churchill River riding. In fact, she is the NDP MP for that riding.